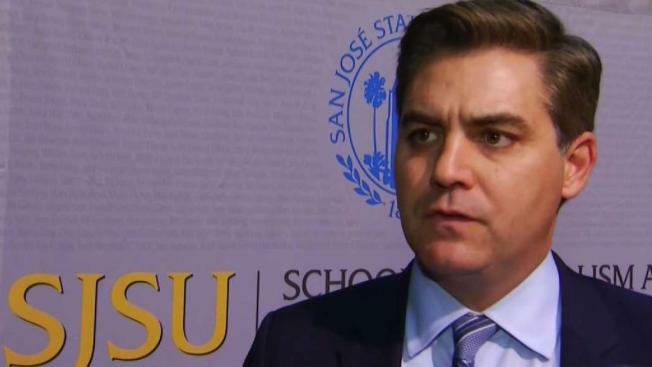 CNN Chief White House Correspondent Jim Acosta received the Hearst Award for excellence in professional journalism at San Jose State University on Thursday night. Students and faculty from SJSU and many other area campuses attended the event, during which Acosta was set to deliver a speech in celebration of the First Amendment, as well as the importance of free speech and media ethics. But he updated his remarks with commentary on the recent mail bombs sent to high-profile Democrat officials and other well-known liberals. "Make no mistake, these events have stiffened our spines," he said. "They have made us more determined than ever to do the news and to get at the truth as to what’s happening in this country." Acosta spent much of Thursday talking with students about the journalism industry, telling them, "Truth is bigger than a bully, and truth is bigger than bombs." Acosta covers the Trump administration and previously covered the Obama administration from the White House and around the world. He reported while following Trump on the 2016 campaign trail.